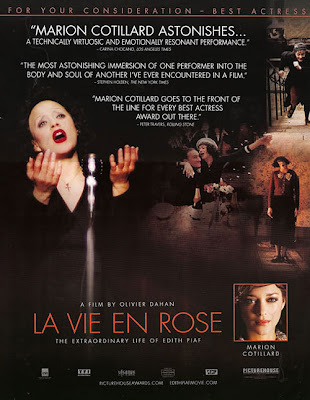 I found this La Vie En Rose FYC ad through Kris Tapley's Red Carpet District, and I like it a lot. I thought Julie Christie was awfully good in Away from Her, but as the grandson of an Alzheimer's patient...I never really believed it. Maybe that is how some people are when they have the disease...but I've never seen it. She was quite good, worthy of a nomination...but it was not a performance on the level of, say, Judi Dench's in Iris, which is the most realistic portrayal of Alzheimer's I have ever seen on film. Her deterioration was real and palpable...Christie never loses who she is...she's just a slightly more forgetful version of her character. Again, not a bad performance...it's really quite good. 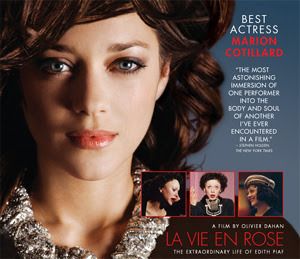 But Cotillard's is on a whole different level.